February meeting is on Friday, February 20th, from 2 to 4. March meeting will be on Friday, March 20th, from 2 to 4. Monthly meeting of the Willamette Group of Haiku Poets is this Friday, June 20, at the Springfield City Hall, 225 5th St. from 2 to 4 p.m. Focus of this meeting will be on-line haiku journals (including haibun, haiga) and other on-line sources. Please bring the portable electronic device of your choice (one that you can surf the web on: laptop, tablet, phone, etc.) If you don’t have one, don’t worry, we can share. This is just an introduction to these on-line goodies. Also bring any haiku you have been working on that you’d like to share. If you are a fiction writer and are interested in joining a critique group, Fiction 1 and Fiction 2 both welcome your inquiries. Please contact Steven Higgins at fayterra@mail.com for Fiction 1 which meets on the first and third Monday of each month at 7PM, or contact Rhonda Zimlich at rhondashere@hotmail.com for Fiction 2 which meets on the second and fourth Tuesday of each month at 6PM. If you are a fiction writer and are interested in joining a critique group, Fiction 1 and Fiction 2 both welcome your inquiries. Please contact Steven Higgings at fayterr@mail.com for Fiction 1 which meets on the first and third Monday of each month at 7PM, or contact Rhonda Zimlich at rhondashere@hotmail.com for Fiction 2 which meets on the second and third Tuesday of each month at 6PM. 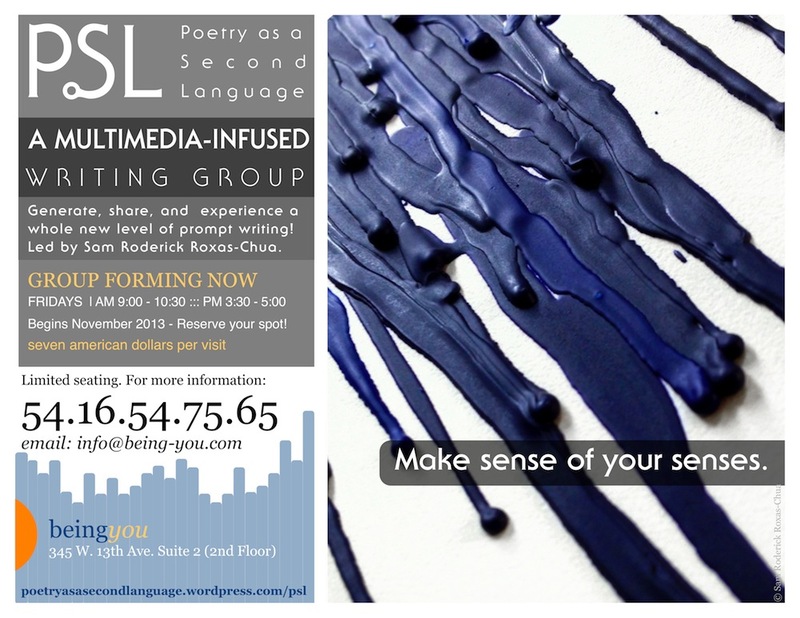 Poetry as a Second Language – New writing group forming in Eugene! For more information visit the PSL Website.